Hi Friends! Welcome back to Healthy Grocery Girl. Today we’re taking a classic favorite, cookies, and making them a little healthier. In fact, these cookies are so good for you – you can enjoy them anytime of day! They’re a great make-ahead option for busy weekday mornings, throw them in your lunch or enjoy as an afternoon snack to boost your energy levels. 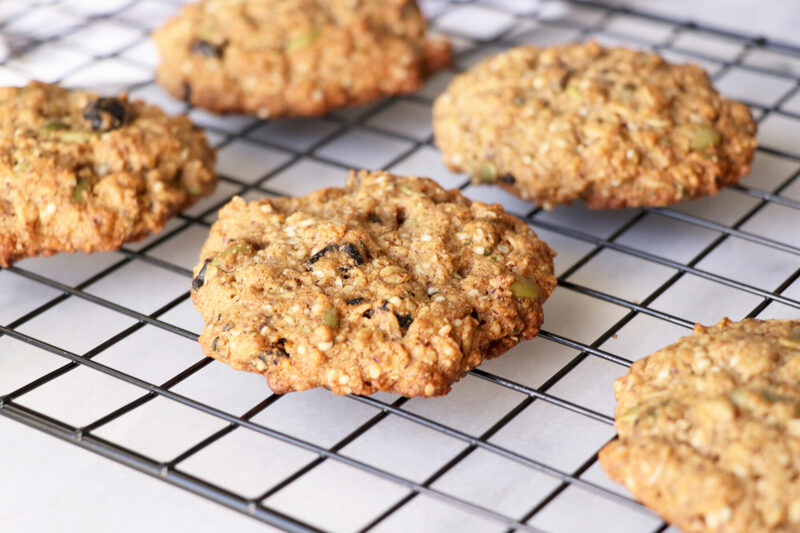 These cookies are nutrient dense and contain protein, fiber, healthy fats and vitamins and minerals! In a small bowl add 1 tablespoon of ground flaxseeds with 3 tablespoons of warm water and let set for 3-5 minutes. The cookies will be a bit crumbly right out of the oven, however they firm up in the fridge! Health Benefits Of A Few Key Ingredients! Hemp Hearts: Manitoba Harvest Hemp hearts, also known as hemp seeds, contain 10 grams of protein as well as 10 grams of omega 3 and omega 6 fats per serving (which is 30 grams). Pumpkin Seeds: These seeds contain protein, fiber, healthy fats and zinc which can boost immunity and skin health! Oats: Oats contains soluble fiber which can help soak up and eliminate dietary toxins and fats – such as cholesterol, from the body! Fiber is essential for optional bowel health and regularity. Nut Butters: A great way to add protein and again more fiber and healthy fats! They also add a rich, creamy taste and texture to these cookies. Tigernut Flour: This is the brand I use! You can order online here. Tigernut flour is a root vegetable, not a nut! It’s perfect for those with a nut allergy or gluten-free. Tigernut flour is slightly sweet, has great texture and contains resistant starch which supports gut health. Thank you to Manitoba Harvest for sponsoring this post. Healthy Grocery Girl is an ambassador for Manitoba Harvest.